Shocking Murder — Seven Persons Butchered and Burnt in the Night. ST. JOSEPH, May 22, 1856. Last night one of the most diabolical and terrible murders occurred within four miles of this city, that ever shocked a community or outraged humanity. Mr. Jacob Friend, with his wife and five children, resided in a neat cabin, embowered by ancient forests, upon the border of the beautiful lake which lies just below our town, and cultivated, in a quiet, but profitable way, a piece of land which he had reclaimed from the wilderness. — The banks of the lake are dotted with these simple habitations, and neighbors were all around him, but his house was not visible to any in consequence of the intervening foliage. The hall of a man or the barking of a dog, could, however, be distinctly heard. Young Barada was there last evening, and left them all in the enjoyment of health and happiness. This morning a young lady was passing, and found the house and its inhabitants in ashes. The news spread like wild-fire, and in a few hours many from our city and neighborhood were on the spot. The natural question with every one was, how so many persons could have been burned in one room. The cabin contained but one room, about sixteen feet square, with two doors, a window and a fire-place. The window and the fire place were in the opposite ends, and the two doors in the opposite sides. One either side of the window, with their feet towards the doors, had stood the beds in which the family slept. From where the beds stood, egress was easy and convenient through the window and doors. It was hardly possible, then, that seven persons — a man of forty-five, a woman of forty, a young man of eighteen, a girl of sixteen, and three small children, could have been burnt from fire originating in the fire-place. There were too many ways of escaping. Nor for the same reason could they be burned to death, if the fire had been communited to any part of the building. The conclusion, then, before any examination, was, that murder, most foul and unnatural, had been busy with his bloody knife, before the fire was ignited. This conclusion was confirmed by silent evidences which lay around. There in the corner, near the fire-place, was a skeleton, and there, just in front of the fire-place, was another; and where the beds had stood, were all the others — a large one with the smallest clasped in its arms, and the rest clustered near. These were evidently the mother and children. Those near the fire-place, the father and the son. By one of the latter was a large knife; and by the other, a three pronged pitchfork, with points extremely sharpened and in front of the house a revolver was found. The jury of inquest are now sitting. — They have arrived at no further conclusion, as yet, than that it was a horrible murder. They will take measures — indeed are doing so already, by examination of witnesses and the weapons found — to trace the murderers. God grant that they may be found and brought to justice. This is the sentiment and prayer of every good men in our country. As I was told to-day by a neighbor, his excellent character and upright deportment made him enemies among the reckless and dissipated. It is said he had a dispute with one of this class, a short time since, about a hog. It was also thought that he had several hundred dollars in gold saved up. What induced the murder, therefore, must have been jealousy, hatred or cupidity; or, perhaps, all. She Murdered and Laid Out Four Children and then Killed Herself. 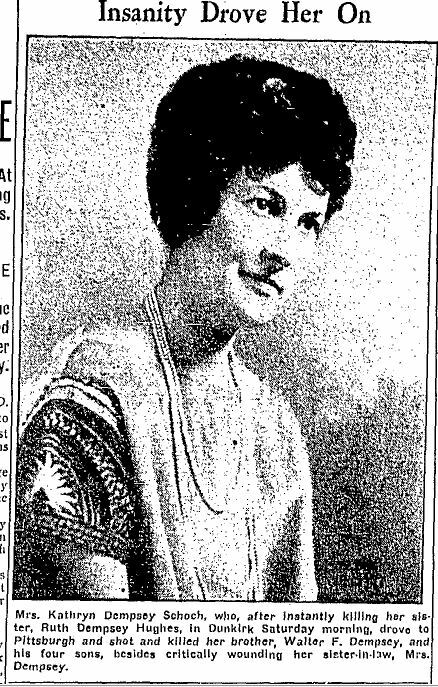 At Chicago, last Saturday morning, Mary Syeboldt, aged thirty-five years, wife of Caspar Syeboldt, a baker, murdered her four children and then committed suicide. The story of the crime is one of the most remarkable in the police annals of Chicago and ranks with any of the Borgia sensations. At 5 o’clock Saturday morning Caspar Syeboldt arrived home after working all night and was met at the door by his wife. She was dressed in a new chemise trimmed with lace and blue ribbons, purchased especially for the awful occasion. She acted strangely and could scarcely stand. “Come in, Casper: come in,” she said, waveing her hand, “and see our little children. They are all dead, gone to heaven, Casper. See how pretty they are. Every one has got nice flowers for the angels.” For a moment the husband was stunned and thought his wife crazy. He hurried to the bedroom and there a strange sight met his eyes. Laid out as for burial were the four children. Matilda, aged twelve; Anton, aged seven; Annie aged two years and six months, and the baby Agnes, aged less than four months. They were dressed in white trimmed with blue ribbon and in their hands boquets of fresh flowers. All were stone dead except Matilda, and she was just breathing. Mrs. Syeboldt followed her husband into the room so full of death and said: “Yes, I sent them all to heaven because God wanted them.” Casper Seyboldt was stupefied, but at last recovered sufficiently to realize the awful deed and then hastened to summon a physician. The latter could do nothing for the dying girl. Attention was then turned to Mrs. Seyboldt, who was in convulsions. She managed to tell that she gave the poison to her children first, laid them out and then prepared herself for death, taking the remnant of a large does of strychnine. She died in great agony shortly after 7 o’clock, and was laid out beside her children. SA N BERNARDINO, March 26. — Missing since Saturday afternoon, Dickey Jensen, 6 years old, and Dean Meecham, 4 years old, had not been found tonight and early tomorrow morning it is estimated that 500 searchers will take up a systematic search for the two children. Police officers tonight advanced the theory the boys had been kidnaped. Fear that they had been drowned in Warm creek was dispelled after the banks of that stream were thoroughly searched today. Late tonight officers learned that the two children had been seen at 5:30 Saturday evening a mile from the city. Once of them was crying. A woman came out of a tent pitched in the brush and was talking to them. Dickey is the son of James Jensen, who is in a hospital suffering from injuries received in a crossing collision between an automobile and an interturban car. Dean is the son of Wells Meecham. Officers at Victorville were requested to search a gypsy camp near that town. The gypsies left here Saturday night. SAN BERNARDINO, March 29 (By International News Service). — Launching the greatest search ever conducted in Southern California, more than 10,000 men assembled at the city hall here and started a systematic hunt for little Dicky Jensen, 6, and his younger playmate, Dean Meecham, 4, missing San Bernardino boys, who have been lost since last Saturday. Responding to a general call broadcast throughout the city and surrounding country by Mayor S.W. McNabb of San Bernardino, farmers left their fields, businessmen their desks, bankers their offices and troops of Boy Scouts in uniform turned out to join in the hunt for the youngsters. Before starting on the hunt today, the posse was addressed by Mayor McNabb, who exhorted to extend their greatest efforts in what is regarded as the critical period in the hunt for the boys. Sheriff W.A. Shay and officers under his command then issued the necessary orders to the big group of men of which they had charge and the search was started. Every foot of the country near here is to be gone over thoroughly. Every vacant house was to be inspected and every brush pile and old well were to be investigated. The Jensen and Meecham boys were last seen playing near their homes Saturday. 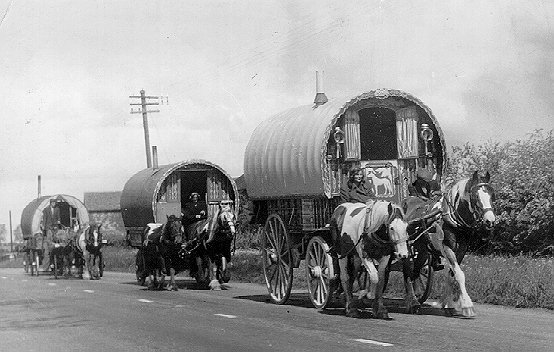 Early reports caused the officers to believe that gypsies had kidnaped the boys and a caravan of these nomads was pursued and searched without result. SAN BERNARDINO, March 31 — While San Bernardino sorrowed the police redoubled their search tonight for trace of the abductor of Dean Meecham, 4, and Dickey Jensen, 6 years old, whose bodies were found trapped in a wooden show case in a vacant store earlier today. Undertakers reported to the police tonight that Dean had been drowned before his body had been placed in the curious death vault. His lungs were found filled with water and his garters were found to be rusted. It was impossible to tell whether Dean had been drowned from the condition of his clothes, as they had been nearly torn from him by his frantic playmate placed alive in the crypt with the dead body. Dean had been dead for some time when discovered by searchers and Dickey, whose pulse still beat feebly, died two hours after being found and he was rushed to a hospital. Authorities expressed the belief that Dickey had been given a powerful drug before being placed in the case in a comatose condition, and that he did not revive for some hours later. Evidence indicated that the drug had caused him to have several spasms. While preparations are going forward for the funerals, which will be held immediately after the inquest on Monday, the parents of both lads are close to prostration from grief and exhaustion after the week of frantic search. In trying to locate the perpetrator of the crime, police became alarmed at the extent of the search, in which more than five hundred school children on vacation and one thousand armed citizens took part. Previously, they believe, he had the boys hiding somewhere in the out skirts of town. They believe he then drugged both boys hoping they would stay under the influence of the narcotic until he could escape. They believe that while he was taking them, probably by machine to some place where he could conceal them, Dean did not remain under the influence of the drug and perhaps began to cry. Becoming alarmed, they think the kidnaper plunged his body into a creek stifling him until he stopped. It is then thought he stuffed the bodies into the peculiar show case in the store building, which was being remodelled and therefore deserted. The strange death trap consists of a rack about four feet high, tapering down like steps of solid wood. In the abandoned store it was shoved toward a blank wall. The space where the boys were concealed was like the underside of a stair case. Under cover of darkness Saturday night, they believe the slayer escaped hurriedly, confident that his terrible crime would not be discovered before the following Monday at least. It was not discovered until a week later. The possibility that the boys were playing about the store and unwillingly trapped themselves, was abandoned with the discovery of water in Dean’s lungs. Police despatched an appeal throughout the country asking that any possible suspects be held for a thorough check will be made to dis- [today?] was made to southern California by the officers. It is probable that all the play mates of the two boys will be questioned by police regarding any strangers who may have been friendly shortly before the abduction. A thorough check will be made to discover anyone who left the neighborhood suddenly after the crime. Present plans are to have a public funeral, which will be attended by the majority of the one thousand citizens who took part in the unsuccessful hunt the past week. The boys disappeared while they were playing in a park on March 24. 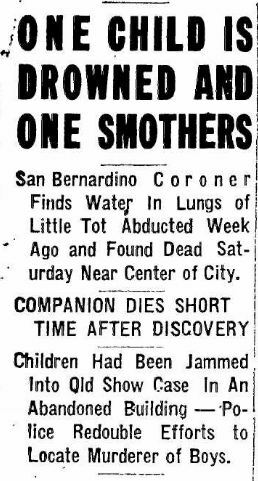 For a week searchers, numbering finally nearly one thousand persons, combed the will mountain country and desert back of San Bernardino as well as the city itself, in the hope of finding trace of the missing youngsters. The parents of neither are wealthy, so extortion was obviously not the motive. It was then thought for several days that gypsy bands, seen near here on the day they disappeared, might have kidnapped them, but a search of all the gypsy camps in southern California proved without result. Rescuers stumbled by chance on the trap early this morning. SAN BERNARDINO, April 2. — The coroner’s jury, composed of 13 members, holding an inquest today over the bodies of Dean Meechan and Dickey Jensen who met their death in a ______ showcase, returned their verdict this afternoon after long deliberation. 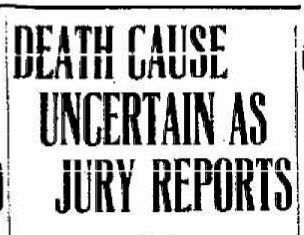 In the case of Dickey Jensen, who was found barely breathing when removed from the case, but who died two hours late, the jury was unanimous in declaring death to be accidental, due to starvation. In the case of Dean Meechan, four of the jury refused to sign the majority verdict tothe same effect. They wrote out an opinion basing their refusal on the testimony of two embalmers, who were positive that water was found in dean’s lungs, and that the body gave other evidences of drowning. Dr. W.D. Lenker, county autopsy surgeon, testified that in his opinion both deaths were due to starvation, and that Dean was not drowned. The district attorney and county officers were present. They indicated that the case will not be dropped despite the fact that no tangible clues as to whether Dean Meecham met with foul play are in their hands. The funeral of both boys were held this afternoon immediately following the inquest. SAN BERNARDINO, April 3. — The case of Dean Meecham and Dickey Jensen, the lads who were trapped in a showcase and for whom a widespread search was conducted for a week, was considered closed today. SAN BERNARDINO, April 17. — (United Press.) — Less than three weeks after little Dickey Jensen’s starved body was found entombed in a wooden showcase with his playmate, Dean Meacham, his grave was made the scene of a fight between his father, James Jensen, and his uncle, Willis Humphries. A complaint brought by Jensen, on file here today, declares Jensen went to the grave to place a [wreath there,?] ____ the two men quarrled over the recent separation of the Jensen’s which took place two weeks after the boy’s tragic death. Humphries charged Jensen with having insulted his sister, Jensen’s wife, and is alleged to have attacked Dickey’s father and beaten him into insensibility. Humphries was arrested but released later on his own recognizance. 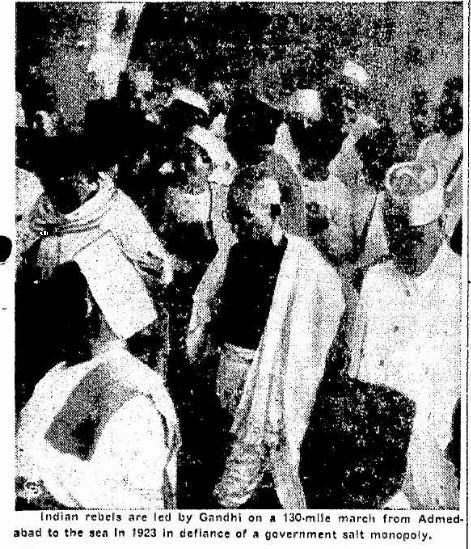 NEW DELHI, Jan. 30 — (UP) — Mahandas K. Gandhi, saint of India, was shot and killed today in an assassination which may set the whole subcontinent of India ablaze with warfare between Hindus and Moslems. The 78-year-old wisp of a man, his body even more frail than usual after a fast which ended a scant fortnight ago, was shot down by three bullets as he walked to the prayer grounds of Birla House for his evening devotions. He was carried into the great mansion home of one of India’s greatest industrial magnates, in the arms of his weeping disciples. There he died at 5:45 p.m. (7:15 a.m. EST), a martyr to the cause for which de dedicated his life — India’s freedom. Gandhi was shot by a man giving the name of Ram Naturam — a Hindu mane. He fired two shots from a revolver at Gandhi and then turned his gun on himself, firing a third shot which grazed his head. 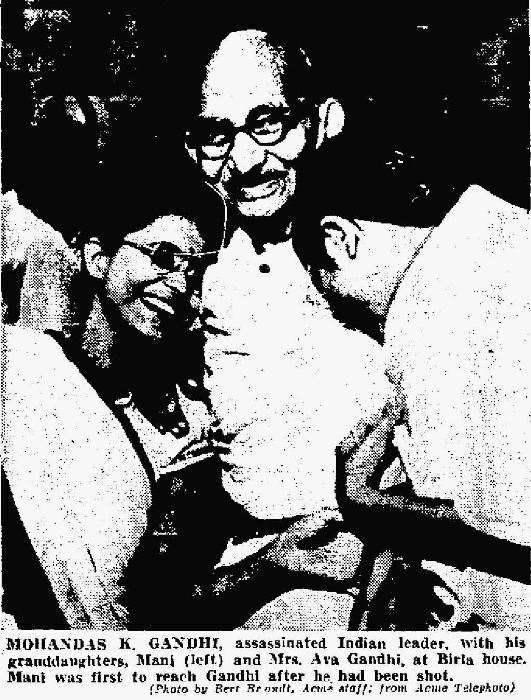 The assassin, a man of about 32 years of age, was seized by Gandhi’s hysterical followers who pummelled him seriously before he was reached by police who drove the crowd back with rifles and fixed bayonets. It appeared that the assassin was a Hindu extremist — one of a group which has bitterly attacked Gandhi’s policies of moderation and has called for a blood war of extermination against the Moslems. Only two weeks ago a bomb was exploded outside Birla House by a member of this group and Gandhi’s followers long had feared for his life because of the threats of these extremists. The assassination seemed certain to mark a turning point in the turbulent history of the 350 million people who inhabit India. NEW DELHI, Jan 30. (INS) Mohandas K. Gandhi, the Hindu political and spiritual leader assassinated today, was unique in history — regarded as a living saint and a combined George Washington and Abraham Lincoln. Nonviolence; live for your fellow man; simple living without pomp or luxury. 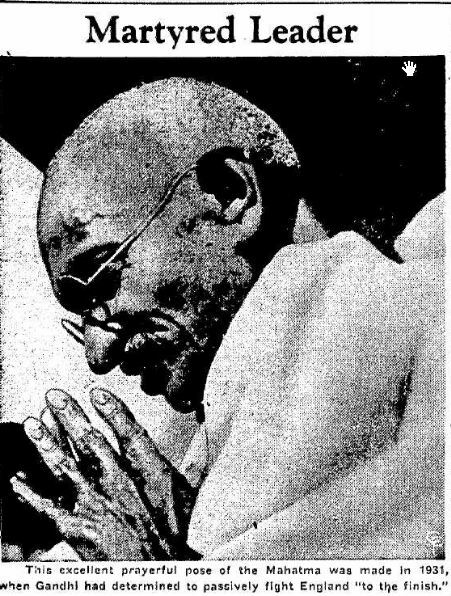 Gandhi, who was cut down at 78, had hoped to live until he was 125. He thought he could do this by being a strict vegetarian for one thing. He lived mainly on oiled vegetables and goat’s milk. He devoted an hour or two every morning to sun bathing, tub bath, massage, and sometimes hsi beloved mudpacks. Gandhi introduced the innocent seeming but powerful weapon of civil dosobedience — a policy of nonviolence that made British leaders helpless in their decades of political clashes over Gandhi’s goal of complete independence. Gandhi was called the mahatma, or “great soul,” by his followers, a term which he disparaged. He died a disillusioned man because his great goal of independence was marred by the splitting of India into two states, one of them Moslem Pakistan. The paper bells and tinsel garlands that made Walter Dempsey’s home ready for a happy Christmas grace a house of tragedy today, for all but one of the family of six are dead, slain, police say, by a woman driven mad by the death of her own son. In addition, the woman herself and her sister are dead in the multiple Yuletide tragedy. Coming to the suburban home of Dempsey, her brother, Mrs. Kathryn Schoch, 37, of Dunkirk, N.Y., a trained nurse made the family merry with gifts for all, but in the night shot them with a pistol and ended her own life with poison. Five of the Dempsey family died in the shooting yesterday. The mother alone still lives. A pitiful note, telling how she could not have her little seven-year-old son with her to enjoy Christmas happiness, was found by police who said it held the explanation of the motive for her act. At Mrs. Schoch’s apartment in Dunkirk, police broke in and found her sister, Mrs. Ruth Dempsey Hughes, dead of a bullet wound. 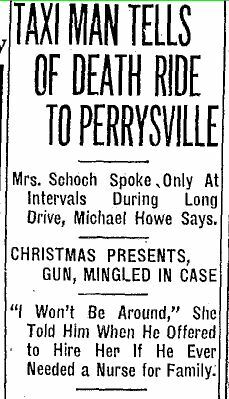 They said she possibly had been slain by Mrs. Schoch before the later left for Pittsburgh. 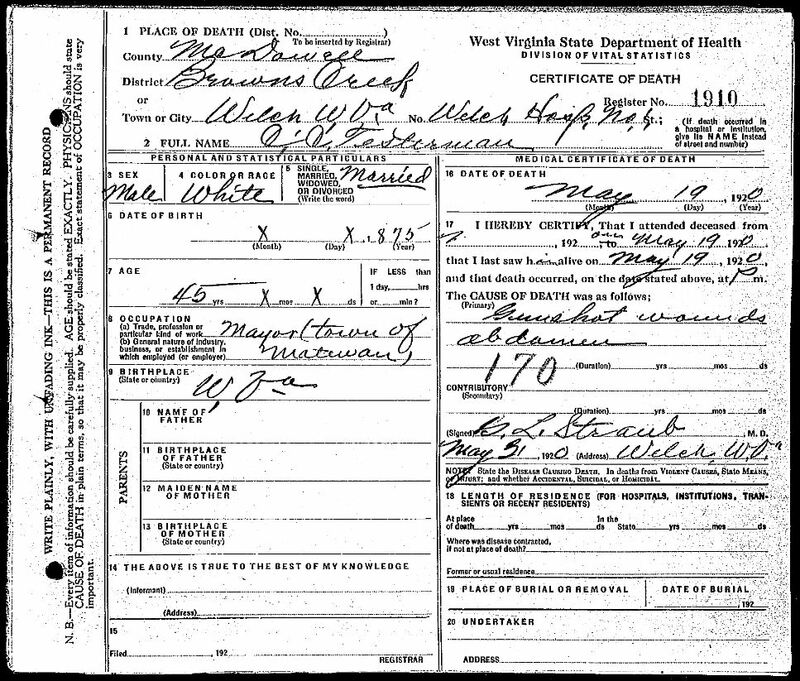 Besides Mrs. Hughes and Mrs. Schoch, the dead are: Walter Dempsey, 42, a welfare worker; Robert, 12; Thomas eight; Walter, Jr., 10, and David, aged 15 months, all sons of Dempsey. Mrs. Clara Dempsey, the mother, is in a hospital with a bullet wound in the head. Physicians said she has a chance for recovery. “It has been humorously claimed for the average frontier town, as a point in favor of its climatic conditions, that it was necessary to shoot a man for the purpose of starting a grave-yard. While this may be true of La Crosse, a ramble among the tomb-stones and monuments of Oak Grove Cemetery will discover the fact that it was unnecessary to resort to such an extreme measure as an inaugural, its identity was more clearly established by being the burial place of a murdered man. 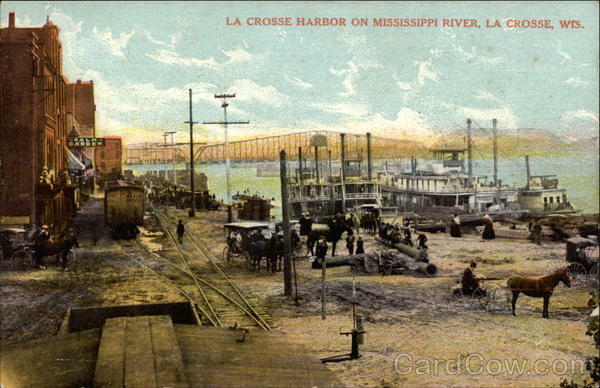 “In the spring of 1852, a man named David Darst, came to La Crosse from Illinois, bringing with him in his employ, William Watts. Mr. Darst was a man of means, and his object in leaving civilization for the hardships of the frontier is unknown. However, he located on a piece of land in Mormon Cooley, and engaged in farming. “On the 5th of June, 1852, six or seven weeks after his settlement in the Cooley, his body was found in the bushes by a man by the name of Merryman, stripped of every rag of clothing and tied to a pole which the murderer had used to carry the body from the shanty in which they lived. Merryman was attracted to the spot by the barking of his little dog. He came into town and reported what he had found, and a number of citizens volunteered to go to the Cooley to investigate the matter and try and arrest the murderer, if he could be found. Several parties were arrested but all proved their innocence to the crowd and were released. — On returning to town the man Watts was found with Darst’s clothes on his back — even to his shirt and underwear. He had all his household goods, money, two yoke of cattle and everything the man had. — He was arrested and, there being no jail, he was given over to the keeping of a Mr. McShodden, who kept him in his cellar, chained to a post. 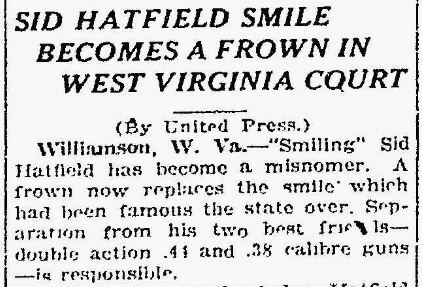 He evidently belonged to a gang of outlaws, as evidenced from letters received at the post-office for him both before and after his arrest. “One evening he escaped. The whole plantation turned out to hunt him; boats scoured the river bank in all directions; men on horseback and armed searched the prairie. But they could find no trace of him. 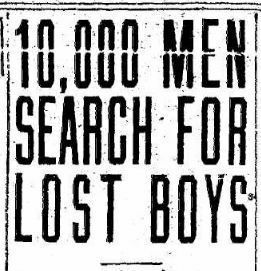 Parties of boys were also looking for him. About midnight he was found by the noise of a file he was using to get rid of his chains, by a party of these small boys and taken into custody. He afterward was furnished by his friends with a file and some iron-colored-paste. This he used in his “prison” and escaped a second time, and was not found for a long time. He was discovered as a hostler at the Ridge Tavern by a man who had been sent for the mail. The mail-carrier, without appearing to notice him at the time, on his arrival home reported him to the Sheriff, who immediately went out and secured him. A one-story stone jail had been erected by subscription after his first escape. He was incarcerated in this and made his exit through the roof of this institution. A new and stronger roof was put on the building, and a large quantity of stone put loose over the ceiling in such a manner that if he tried again it would fall on him and crush him. “Watts confessed his crime. He said that Darst was lighting the fire on the morning of the murder, he struck him on the head with an axe. He had no other reason for the deed than that of securing the money and property of the victim. — At the funeral of Darst, which occurred the Sunday following the discovery of his body, the services were held in a small building on State street, with the murdered man in his coffin and the murderer in chains standing at the head. It was understood very generally, that as the funeral procession left for the cemetery, Watts was to be lynched. The Rev. S.C. Sherwin conducted the services, and, although more than one rope was in the hands of the party, such was his influence over the populace that he prevailed upon them to let law and order take their course. THE MURDER OF DAVID DARST. A great many fights and fracases occurred about this time, but on June 3, 1852, one of the most deliberately-planned and cold-blooded murders ever chronicled was committed in Mormon Cooley, which greatly excited the entire community, and came near ending in the lynching of the accused. David Darst, it seems, had at a comparatively early day removed from Galena, 111., and settled on a claim out in Mormon Cooley. He built him a log hut, and, with two yoke of oxen, was soon in a prosperous condition for a settler of the times. 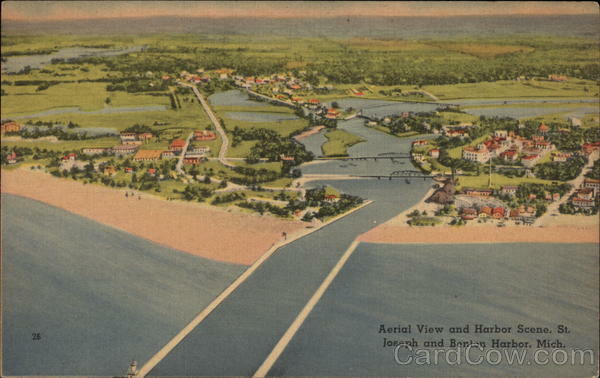 In the spring of the year in which the murder was committed, there came up the river from Galena a young man named William Watts, who had known Darst previous to his removal hither, and seeking him out, proposed making a visit to his friend of former days. After remaining here a short time, accepting the hospitality of his whilom friend, Watts deliberately murdered Darst, and, stripping the body of clothing and valuables, hid it in a plum thicket that occupied a ravine near the house. The murderer dressed himself in the garb of the dead victim of his devilish covetousness, and yoking up the oxen, came into the village for the purpose of disposing of the plunder. The same day that Watts came out of the cooley, Mr. Merriman, an old bachelor, who had a cabin not far distant, was riding up the ravine on horseback, accompanied by a dog, his daily companion, the keen scent of which detected the dead and decaying remains of the murdered host of Watts. The dog ran into the thicket and thence back to his master, manifesting the utmost concern, and betraying an anxiety that indicated something out of the usual channel. Mr. Merriman finally dismounted, and following the dog into the thicket, was nearly paralyzed and stricken dumb by the horrible sight which met his gaze. There lay his neighbor, stiff and stark and dead, his skull crushed and his throat cut, in the last stages of decomposition, and exuding an odor which was stifling. He at once gave the alarm, and hurrying to the village, startled the inhabitants with the story of what he had seen. While this condition of affairs was rendering the village a scene of pronounced commotion. 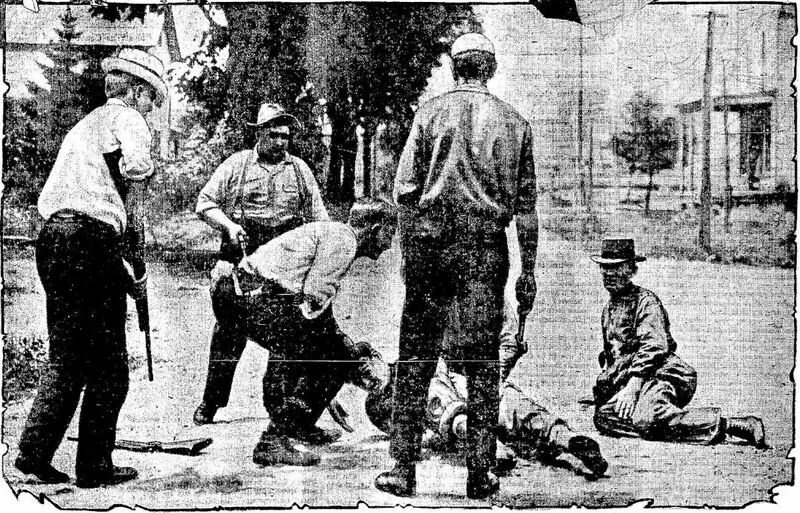 Watts was engaged in drinking and carousing, and when he had reached a condition of helpless intoxication, he solved the mystery which had surrounded the crime, and was arrested, narrowly escaping lynching. An inquest was held over the remains of Darst, his murderer being obliged to confront the remains, and when moved to stand at the head of the coffin. During the funeral there were a number in attendance who had ropes concealed about their persons, and but for an eloquent appeal made by Elder Sherwin to let the law take its course, and not disgrace the village by mob violence, the prisoner would have been executed. At that time the court house was finished, but no jail had yet been provided, and the stone basempnt on Pearl street, between Second and Third streets, was leased from Col. Childs for the confinement of Watts, who was guarded by a man named McSpadden, hired for that purpose. The prisoner was heavily ironed and safely kept for awhile, but the expense was very considerable, and a jail was built for the safe keeping of the prisoner and others who had been arrested for trifling offenses. In its construction the ceiling was made of joists spiked together, and the attic filled with pounded rock, to the end that a prisoner, if he attempted to bore through the ceiling would be deluged with stones. It was not long, however, before the prisoner dug out through the foundation walls, and when his escape was announced the public turned out to effect his re-capture. About midnight on the second day of the pursuit a party of boys engaged in the search heard the noise of some one filing in the prairie grass near Deacon Smith’s. The alarm was given, and Watts was re-taken and re-conveyed to jail, where he was heavily ironed. 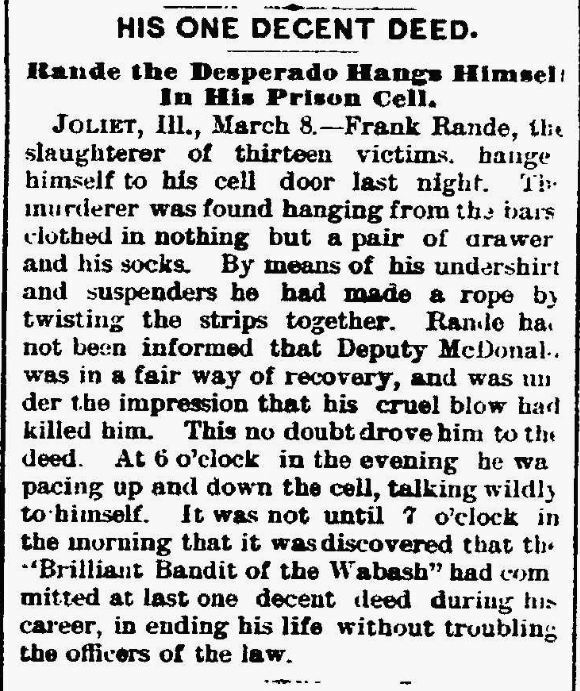 Notwithstanding this, and the further assurance endeavored to be secured by the Sheriff visiting him at all hours of the day and night, the prisoner eluded the vigilance, attempted and escaped once more. Search was again undertaken, but with poor success, for awhile at least. 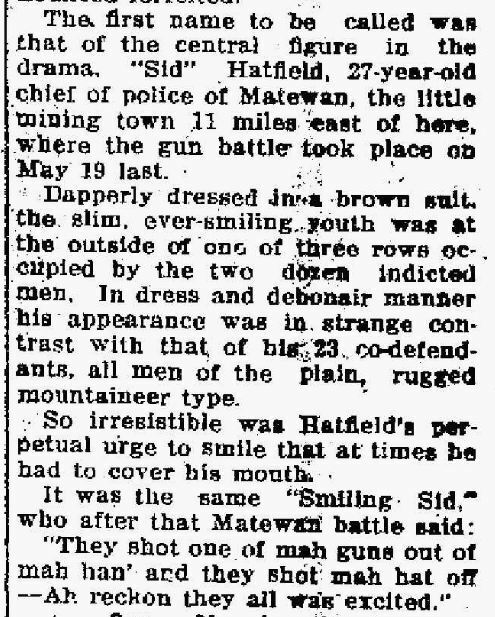 He could not be found anywhere, and the officers and citizens were about giving up the search, when a stagedriver, who twice a week made trips to Hazens, out on the ridge, discovered that Watts was disguised and acting as a hostler at that place. Upon his return he detailed the whereabouts of the fugitive, who was arrested and brought back, and, obtaining a change of venue to Bad Axe County, was tried, convicted and sentenced to Waupun for life. This uncivil and uncalled-for speech on the part of Watts excited Merriman’s suspicions, who sought assistance and discovered the body of Darst. An alarm was given, and Sheriff Eldred arrested Watts and the two Kimballs, all three of them very much intoxicated. That night he locked himself, with the three accused, in Chase & Stevens’ office, and in the morning the Kimballs were horrified upon being informed of what was alleged against them. They at once proposed to “churn out the brains of that critter,” alluding to Watts, but were dissuaded from such an act by the Sheriff, and permitted to visit their families on parole, whence they returned in a few hours to stand trial. Watts was confronted with the dead body of his victim, but gave no sign of guilt, and a cry was raised to lynch him. This, however, was not done, owing to cooler counsels, and the prisoner was turned over to a Mr. McSpadden, residing on Front street near the present ferry, who kept him in a room in his house, the outer door of which was made fast by rolling a pipe of liquor against it. The prisoner escaped soon after, and was not recaptured until the following February, notwithstanding the offer of $200 reward for his apprehension, when he was retaken by Messrs. Kellogg and Wasson, and immured in the jail which had been constructed in the meanwhile, where he was manacled, shackled and chained to the wall for safe keeping until his trial, which took place in Crawford County, and resulted in his conviction. The jail to which allusion is here made was a small one-story stone structure, extending four feet beneath the surface of the ground and abutting upon the rear wall of the court house, into which entrance was afterward made. It was not safe, and in after years was succeeded by the present compact and secure building. The account preceding was obtained from Mr. Eldred, who made the arrest of Watts in the first instance. When the war broke out, Watts received a pardon, conditioned upon his enlisting in the service, which he did, and all subsequent trace of him was lost. A most singular occurrence attended the end of Mr. Merriman. Just two years from the time in which his little dog was the means of enabling him to discover the dead body of Darst, he went wandering up the same ravine, and fell dead in the identical thicket whence he assisted in removing the murdered remains of his friend. The old man was missed by his neighbors, who instituted a thorough search for him, and, while passing through the little cooley back of the missing man’s hut, they encountered his dog. The animal again acted strangely, and scampered off to the thicket as he had done when Darst was missing, then returning and repeating this several times. The searchers finally followed the dog, and were led to the corpse of his master. It was thought that he met foul play, but an examination led to a verdict by a coroner’s jury that he had fallen down dead from an attack of heart disease, almost in the form hollowed out by the body of Darst two years before. 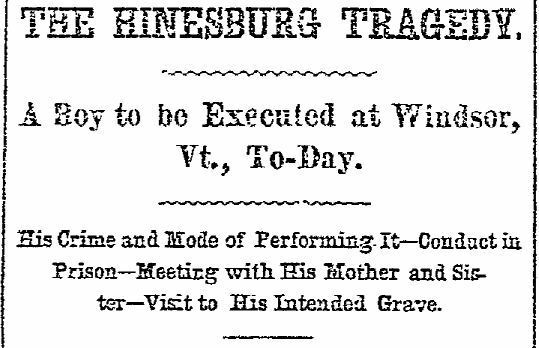 Thus ends the particulars of one of the pioneer murders committed in La Crosse after it became a county—certainly, one of the most cold-blooded and brutal the criminal annals anywhere record, and one whence escape from the usual penalties was comparatively easy. But the frontier settlements even then were too sparsely settled to admit of the expense of a cumbersome system of jurisprudence employed in older settled communities, and the first settlers were always a law unto themselves. But as time passed and the majesty of the law was established,the practice of holding one’s self responsible for his conduct became obsolete, and the redress of grievances was reserved to the courts, those agencies of civilization, and, so equitably have the scales of justice been adjusted, and so irresistibly right have questions arising thereunder been adjudicated, that if it is beyond the wisdom of man to avoid erring in all the affairs of this life, the practice of repetition in evils that have been decreed as such should have been abrogated years ago. 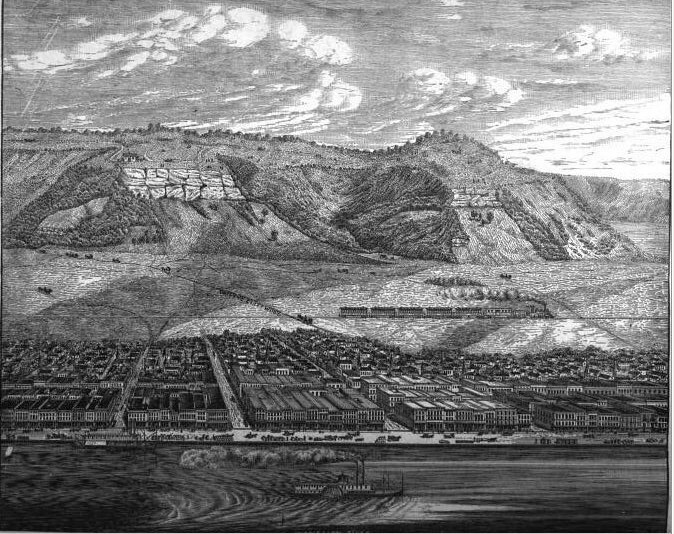 Image of Irish Hill – San Francisco in the 1890s from the PIER 70 San Francisco website. Brutal Murder on the Water Front. The Supposed Murderer Is Safely in Custody. But the Police Believe They Have Without Doubt Captured the Guilty Man. A horrible murder was committed in the rear of the Grizzly Bear Saloon, 11 East street, last night. A woman about 30 years of age, whose name is unknown, was stabbed to death and left dying in the little apartment by a man who is supposed to be Martin O’Neil, chief of the galvanizing department of the Union Iron Works. O’Neil entered the saloon with the woman about 9 o’clock in the evening and called for drinks. They retired to the room in the rear and remained there for several hours. About midnight one of the proprietors. whose suspicion was aroused, went into the room, and as he entered heard a door leading to an alley close. The woman was lying unconscious upon the floor. A pool of blood flowing from wounds in her abdomen and thighs surrounded her. The patrol wagon was summoned and she was sent to the Receiving Hospital, but died upon the way. The owner of the saloon and several of his friends pursued the man who had left the dying woman on the floor. They captured him and turned him over to the police. He said his name was Martin O’Neil ; that he lived at the Potrero, and that he is employed in the Union Iron Works. He is a short rather corpulent man.with a bloated face, reddened by intoxication. He declared that he met the woman and took her into the place to drink, but could not recollect what had taken place between them there. O’Neil’s shirt sleeves were covered with blood and there were gory stains upon his coat and vest. No weapons were found upon him and he was thrown into the tanks of the City Prison. He will probably be charged with murder to-day. When O’Neil was searched in the prison papers were found upon him showing that he had lived in Oakland, and that his wife had been divorced from him on account of his cruelty. O’Neil’s face was scratched in several places and blood was found under the finger nails of the woman. An examination of the body at the morgue failed to disclose the name of the victim. 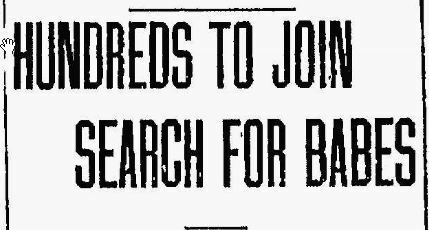 Some small change, a key, a breastpin and a return ticket to Oakland were the only articles found upon her. 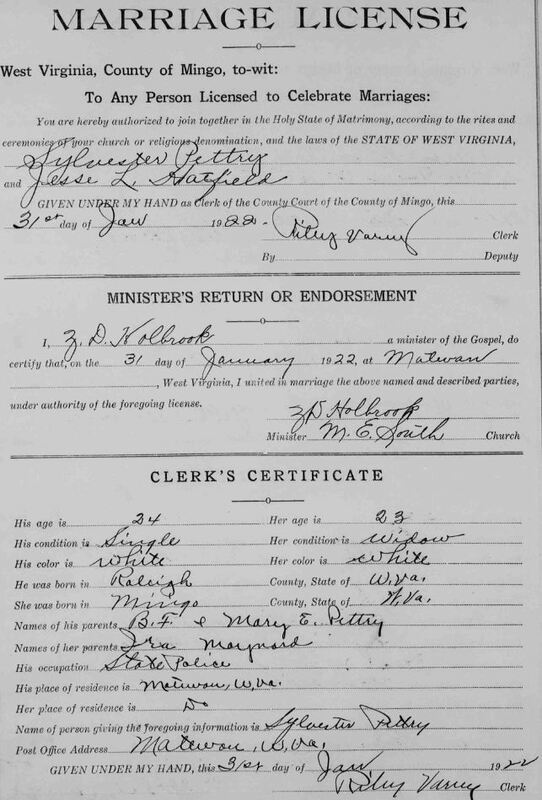 This ticket would seem to indicate that she had come from Oakland with O’Neil. 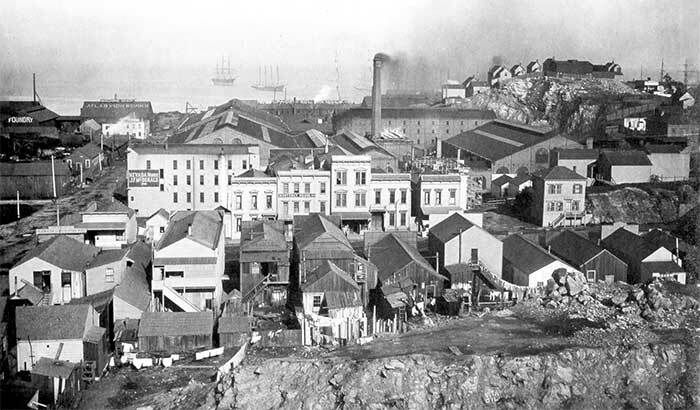 Image of the Union Iron Works docks – 1890s from the Found sf website. TERRIBLE CRIME IN A DIVE IN SAN FRANCISCO. 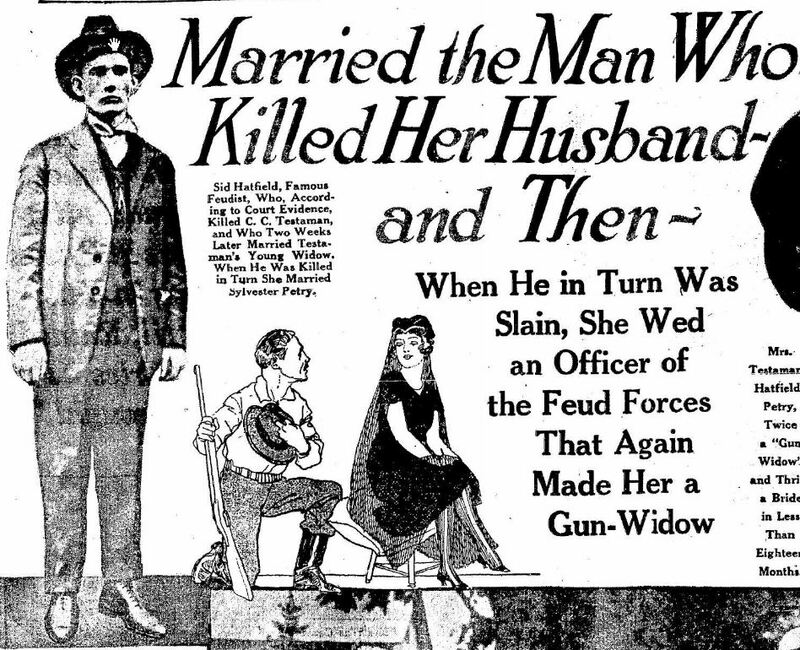 The Wife of a Newspaper Man Enticed Into a Saloon and Murdered by Her Drunken Companion. — The Fiend Arrested. SAN FRANCISCO, Cal., June 29. — One of the most atrocious murders ever committed in this city occurred at an early hour Wednesday morning. The full details of the crime did not become known until late last night and are too revolting to admit of extended mention. 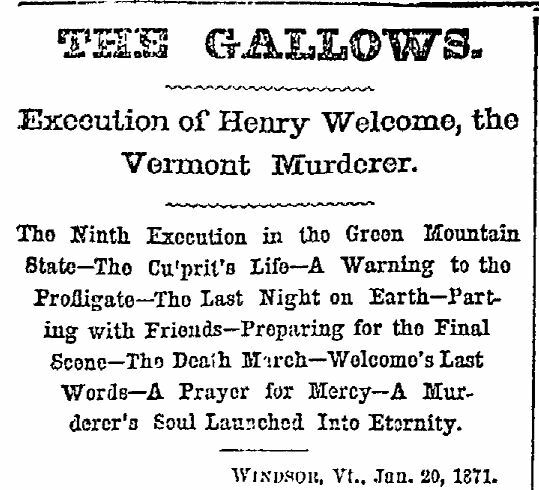 The victim was Mrs. Kate Griffes, wife of a reporter employed on one of the local papers, and her murderer was Martin O’Neill, foreman of the galvanizing department at the Union Iron Works. The woman was found in a dying condition in a private room of a saloon on the harbor front early yesterday morning and died while being removed to the hospital. It was known that O’Neill had been in the saloon with her, and he was accordingly arrested, though it was believed for some time that the woman had died from natural causes, as no marks of violence were found upon her. An autopsy was held later in the day and it was discovered then that the wooden handle attached to a bouquet of flowers, had been thrust into her body and bent and twisted until a great gash had been torn in the flesh and her internal organs mutilated in a most horrible manner. Parts of the bouquet were found embedded in her stomach. The fiendish work of the murderer had induced internal hemorrhage, which resulted in death in a short time. Mrs. Griffes formerly lived in Philadelphia, but came here some years ago and had been living in Alameda, across the bay, with her husband and 6-year-old daughter. She was a young woman of very attractive appearance. Recently she had become addicted to the use of intoxicating liquors and had been in the habit of visiting the saloon in which she met her death. While coming to San Francisco on the ferryboat Tuesday evening she met O’Neill, with whom she had a slight acquaintance. He is 50 years of age and has a family. He invited Mrs. Griffes to the saloon and they remained there together several hours, during which time they drank a great deal and became very much intoxicated. It is not known definitely just how the crime occurred, but there is every reason to believe that O’Neill, frenzied by liquor, attempted an assault. O’Neill was in a drunken stupor when arrested and claims he remembers nothing of the tragedy. Martin O’Neil Accused of the Crime. A THEORY OF THE POLICE. Two of the Victim’s Female Friends Doing Their Best to Avoid Unnecessary Publicity. A charge of murder was entered on the books at the City Prison yesterday morning against Martin O’Neil for the killing of Mrs. Kate Griffes. He positively refuses to talk, always giving the same answer that he is acting under the advice of his attorney. He looks sullen and dejected and appears to fully realize the gravity of the position in which he is placed. The police are diligently hunting up his record and every little detail in connection with his meeting with Mrs. Griffes and what took place subsequently. O’Neil’s wife has been the mother of sixteen children to him, only three of whom are now alive, and yet he treated her harshly and cruelly. It is known that he had many intrigues with other women, and old as he was he considered himself something of a rake. Every effort has been made by the police to find the instrument with which the fatal blow was dealt, but without “success. There is a growing impression that the terrible wound was caused by the stem end of the bouquet which Mrs. Griffes carried in her hand when she entered the Grizzly Bear saloon with O’Neil. Detective Bohen in Breaking of this theory yesterday said: “I believe he inflicted the fatal blow with the bouquet, which contained many large stems, and may have been made around a small stick for a handle. The shock. I think, killed her instantly, and when he saw the blood on his hand and that she was apparently dead he fled from the room. There had been no struggle, I think, for the woman’s clothing was not torn. Her body must have been exposed when the fatal blow was struck, for her clothing was not penetrated, and this is further supported by the condition of her clothing as she lay on the floor after falling from the chair. As partly bearing out this theory, when the woman’s clothing was carefully examined at the Morgue yesterday, no sign of a tear or cut could be found, but there was a broken twig nearly as large as an ordinary lead pencil and about five inches long sticking in the clotted blood on the clothing that covered the wound. There is one thing that puzzles the police. When it was first told O’Neill after he had been arrested that the woman was murdered, he said, “Well, somebody will be glad of it.” From that remark the police, infer that O’Neill must have met her before Tuesday night, and they are making diligent inquiries to find out what O’Neill really meant by bis remark. Mrs. Griffes has quite a number of intimate friends in this city who became acquainted with her about eighteen months ago, when she lived at 803 Golden Gate avenue. Mr. and Mrs. B.F. Bates and Mr. and Mrs L.H.” (Laura) Bricker were in ‘this house at the time, and the three women became very close friends and were together a great deal. After leaving the Golden Gate avenue house Mr. and Mrs. Griffes moved to Alameda, and Mr. and Mrs. Bricker soon followed them. The three women k«pt up their friendly connections until a few months ago,” when Mrs. Bricker and Mrs. Griffes had a falling out and have not been on speaking terms since. Mrs. Bricker was in the city early yesterday morning and called on Mr. Bates at his office, but she returned to Alameda and was not to be found again. She informed Mr. Bates that she never heard of O’Neil before, and did not think Mrs. Griffes knew him. A CALL reporter called at Mrs. Bates’ residence, 299 Hyde street, yesterday afternoon and was told by both the landlady and Mr. Bates that Mrs. Bates had crone to Alameda to get; some clothing for Mrs. Griffes. There must have been a misunderstanding on the part of the landlady and Mr. Bates, for when the reporter called in the evening on Mrs. Dr. Burns at 1223 Market street it was learned that Mrs. Bates had been there all day. Mrs. Burns is Mrs. Bates’ mother, and was greatly distressed to think that her daughter’s name has been drawn into the affair. 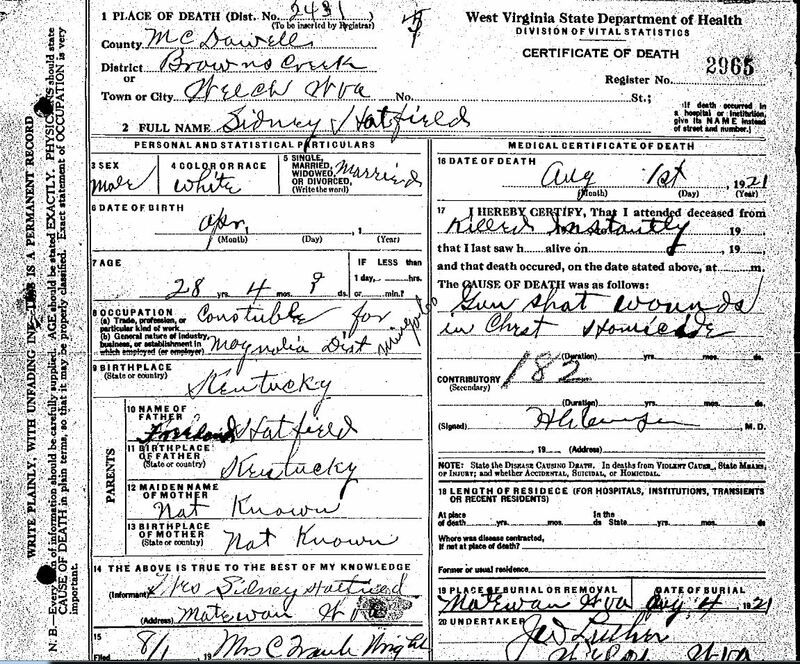 Mrs. Bates could not be seen, but her mother, who knew the murdered woman well, stated that Mrs. Bates never heard of O’Neil until the name appeared in the newspapers. It is probable that O’Neil and Mrs. Griffes met some time before their last and horrible spree. While there is no direct evidence to that effect, it is believed that O’Neil went to Oakland Tuesday evening for the purpose of meeting some woman. 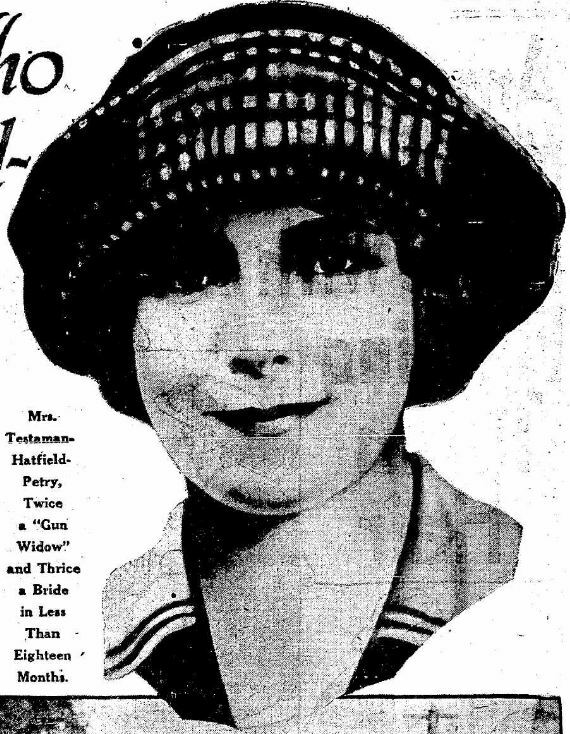 One of the drivers on the Fifth-street line, with whom O’Neil rode to the city from the Union Iron Works that evening, told a man at the works yesterday that O’Neil said he was going to Oakland to meet his “trash.” It may have been Mrs. Griffes or it may have been some other woman. If, however, O’Neil and Mrs. Griffes returned to the Grizzly Bear Saloon at the hour mentioned by the bartender it is almost certain that he did not go all the way to Alameda to meet Mrs. Grilles. Mrs. Beggs denies the published statement that her daughter told the police she saw O’Neil, as she thought, with a tall blond woman entering the waiting-room at the foot of Market street to go to Oakland on the 12:15 p. m. boat on Tuesday. She states that neither she or her daughter ever knew O’Neil. The inquest will be held to-morrow at 10:30 o’clock. SAN FRANCISCO, July 1. 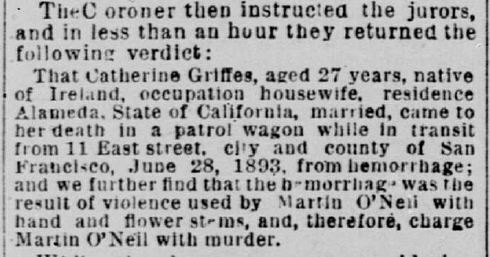 At 11 o’clock this morning Coroner Hughes commenced an inquest into the death of Mrs. Kate Griffes, who was killed in the Grizzly Bear Saloon by Martin O’Neil. A large crowd was in attendance, many being attracted by the desire to see O’Neil and hear his story of the crime. He appeared in his shirt sleeves, attended by Robert Ferral, his counsel. After the jury had viewed the body the remainder of the day was spent in examining witnesses. SAN FRANCISCO, July 3. — After an investigation of the circumstances attending the brutal murder of Mrs. Kate Griffes in a water front saloon last Tuesday night, the coroner’s jury this evening brought a verdict charging Martin O’Neil with murder. SAN FRANCISCO, Nov. 20. — The trial of Martin O’Neil, the man who is charged with the revolting murder of Kate Greffes in a private room of a water front saloon on Jun 28th last, was commenced before Judge Wallace this morning. The work of empaneling a jury was commenced. SAN FRANCISCO, Nov, 22. — The jury-bribing cases of Frank McManus and W.J. Dunn were again continued yesterday morning until Thursday noon by consent, the court and District-Attorney Barnes being engaged in the trial of Martin O’Neil, charged with the murder of Mrs. Kate Griffes last June. A Jury Not Yet Selected for O’Neil. Not Easy to Get Men Who Are Unbiased. Forty Citizens Examined Yesterday – The Dead Woman’s Husband in Court. Meanwhile the defendant sat throughout the proceedings, his wife beside him, with the old restless downcast stare, and the same nervous twitching of the hands. Once or twice he looked up, and once or twice he spoke, but it was not until the weary day’s work was over that the unhappy man was seen to smile feebly at some cheery remark made by his counsel, Carroll Cook. And the gaping crowd have stood, wondering to themselves, if “that feeble-looking spectacled old wreck” can be the diabolical villain they had read of. A Jury Secured in Martin O’Neil’s Case. The Testimony That Has Been Offered Thus Far. From the “Ladies’ Entrance” to the Wineroom— The Dead Body on the Floor— The Arrest. 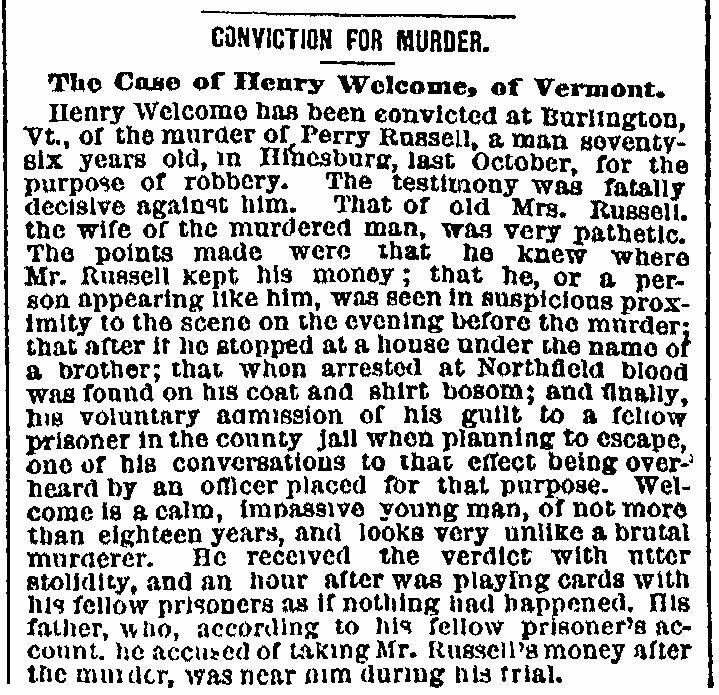 After three days spent in securing eleven jurors in the case of Martin O’Neil, who is charged with the murder of Mrs. Kate Griffes, the twelfth man was accepted yesterday in less than an hour after court was called, and the jury finally empaneled consists of S. W. Dixon, the last one chosen, and David Keil, Charles Ashton, Arthur Patterson, Lawrence Felvey, Manfred H.Heyneman, W. F. Muller. Charles Benjamin, W. T. V. Scbenck, W. B. Isaacs, Monroe Greenwood and Julius Steinberger. As soon as the work of securing the jury was:completed Assistant District Attorney Black opened the case for the prosecution by relating the story of the crime and all the attendant circumstances. He stated that the prosecution would introduce evidence to prove that O’Neil and Mrs.Griffes went to the Grizzly Bear saloon on East street together on the night of June 28 last, and that they occupied a private room there from about 10 p. m. until after midnight; that during that time they were frequently served with liquor; that about 1 o’clock O’Neil suddenly left the saloon alone, while at the same time Mrs. Griffes was found dead in the wineroom from wounds, which the circumstances would show had been inflicted by O’Neil. J.H. Griffes, the husband of the deceased, was the first witness called by the prosecution. He testified that the last time he saw his wife alive, was at their home in Alameda on the morning previous to the day of her death. He said that the deceased was at times fond of liquor, and that periodically the appetite was almost uncontrollable. Her absence from home on the fatal night had not caused any alarm, as he supposed she was with friends in this city. William H. Davies, the proprietor of the Grizzly Bear saloon, occupied the afternoon with his testimony. “At this time, as indeed all during the evening, the conversation was of a pleasant nature, and I heard nothing which would indicate a quarrel of any kind. The wineroom is so situated that any unusual noise could be heard in the barroom, or in the.restaurant next door, which is separated only by a door, which is now nailed up. “About half past 11 I was serving them with an order, and I asked them if they were going back to Oakland or Alameda that night. Mrs. Griffes replies that she was going to stay with Mrs. Bates’ mother that night. I took in another round of drinks about midnight, in which I had asked them to join me, and then I went out for my supper. When 1came back, a .half hour later, I was busy making up my cash, and at other work about the saloon, until a man named Ferris who frequents my place, mentioned to that the man was leaving the wineroom alone, and I at once went to the door, but could not push it back more than six inches, but I stuck my head in far enough to see that the woman was lying on the floor with her head on a chair and her feet against the door, and that there was blood on the floor. At the close of Davies’ testimony the court took an adjournment until Monday at 10 a. m.
Martin O’Neil Receives the Full Limit. Judge Wallace Speaks His Mind Freely. O’NEIL WAS GUILTY OF MURDER. Absurd That One Who Committed Such a Deed Should Get Off With a Few Years in Prison. Martin O’Neil was sentenced by Judge Wallace yesterday to ten years’ imprisonment for the killing of Mrs. Kate Griffes. The occasion afforded Judge Wallace an opportunity to express his views upon the present system of criminal procedure. Wearied and disgusted by numerous futile attempts to see that each offender receives an amount of punishment proportionate to his crime, the Judge in addressing O’Neil yesterday, and using the case at bar for an example, commented strongly upon the manner in which the hands of justice were tied by the constitution as it at present stands. He also took occasion to remark that in his opinion the verdict of manslaughter was hardly borne out by evidence at the trial, in that such evidence pointed, at least, to a verdict of murder in the second degree. The prisoner sat quietly in the courtroom, apparently unconcerned, but betrayingly the restless twitching of his hands that he feared the ordeal before him. His wife sat beside him as before and sought by her loving presence to do what she could to help him bear his fate. Carroll Cook, on behalf of the prisoner, called attention to the fact that his client was drunk at the time and oblivious to what was going on. He insisted that the punishment should be light. Judge Wallace then resumed: “The necessary import of the verdict, is that you did in fact feloniously take the life of the deceased woman, and by the disgusting and brutal means shown in the evidence; you were, therefore, plainly guilty of murder; that yon were drunk when you did the act afforded no defense as against the charge of murder in the second degree, and as the entire jury appear to have been satisfied that you committed the act charged, you should at least have been convicted of that offense —the offense of murder in the second degree; it is understood that some eleven of the gentlemen of the jury were of that opinion, too. Among the twelve, however, one was found who, while he, like the others, was convinced that you feloniously took the life of the woman, nevertheless refused to concur in a verdict of murder, and so the others of the jury were forced either to adopt the views of their one dissenting associate or find no verdict at all. “It is provided by the constitution that in civil cases three-fourths of the jury may render a verdict, but in criminal cases absolute unanimity is still required by our law. The conspicuous failure of substantial justice which has thus resulted in your case may possibly suggest to thoughtful men the advisability of changing the constitution, so as to permit a number of juror*less than the whole to render a verdict in criminal as well as in civil cases. “The verdict here, as already observed, is a verdict of manslaughter; the extreme measure of punishment mentioned in our statute for that offense is imprisonment in the State Prison for a term not exceeding ten years in duration. And then, under the law of this State, even should this extreme penalty be now adjudged against you, the term of your actual imprisonment is subject to material reduction, for a sentence of ten years’ imprisonment formally imposed here will probably turn out by mere operation of statutory law to be an imprisonment of no more than six years and six mouths in actual duration, to say nothing of the interposition of the executive authority to still further reduce the term or to pardon the offense outright. For wantonly and feloniously taking the life of a defenseless woman six years’ and six months’ imprisonment! In fact, the system of criminal administration at this time established by our constitution and laws would appear wholly inadequate to deal properly with crimes such as yours. The unhappy man’s wife on hearing the sentence burst into tears, while O’Neil sat with his hands closed together and his eyes bent on the ground, while his mind doubtless traveled back through circumstances and events in the past which, through his own fault alone, led to the utter ruin and desolation of his home. He was quickly led from the room and the court proceeded with the regular business of the day. What’s that old saying? The apple doesn’t fall far from the tree? 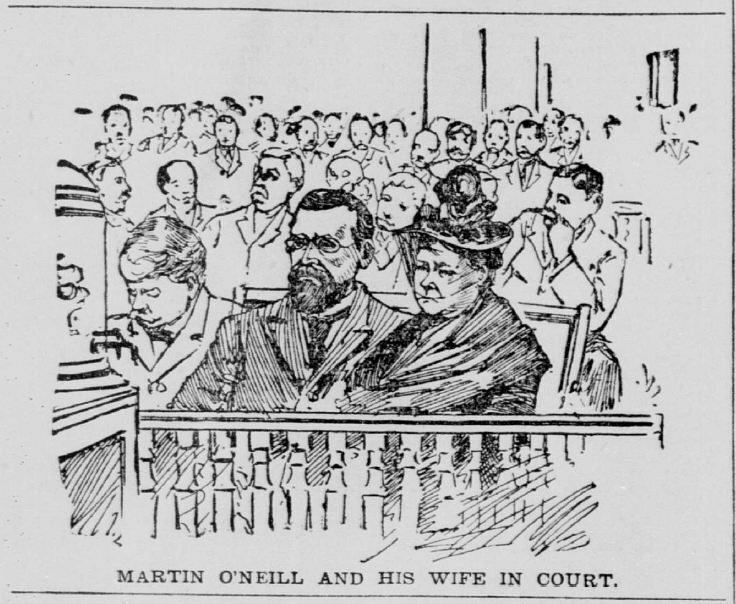 Martin O’Neil Jr., the son of the man now incarcerated in the San Francisco prison charged with the murder of Mrs. Kate Griffes in a water-front saloon, was tried before Judge Allen yesterday and convicted by the jury after a few minutes’ deliberation on a charge of battery, committed on an old man named George Creverling on May 14 last. O’Neil, Jr. was drunk at the time of the beating and kicking. He pleaded his own case, claiming that what he aid was done in self-defense. His old mother sat by him yesterday in court. Young O’Neil is a hard enough working fellow when sober, but he has been in trouble before through his drinking, and always heretofore his mother has been able to get him out of trouble. He will be sentenced to-day.